(MARANA, AZ) – September 28, 2010 – An investment by Google pioneer Ray Sidney in The Residences at The Ritz-Carlton, Dove Mountain near Tucson, AZ has signaled an “all clear” to snowbirds seeking a second home in a perfect golf resort climate. Sidney’s capital infusion has eliminated all community debt creating lower cost opportunities for luxury home buyers interested in purchasing the highly-personalized homes or custom estate homesites. David Mehl of Cottonwood Properties, Inc., developed this extraordinary property nestled in the foothills of the Tortolita Mountains. The luxury estate homesites are placed strategically along the 27-hole Jack Nicklaus Signature Golf Course and near The Ritz-Carlton, Dove Mountain luxury resort hotel. Sidney’s investment in The Residences at The Ritz-Carlton, Dove Mountain fits with his personal mission to invest in and develop sustainable real estate projects. A Harvard graduate with a PhD from MIT, Sidney joined Google in 1999 as a software engineer, becoming the company’s third employee. He left in 2003 and has since been involved in a variety of philanthropic enterprises focused on the environment and education. 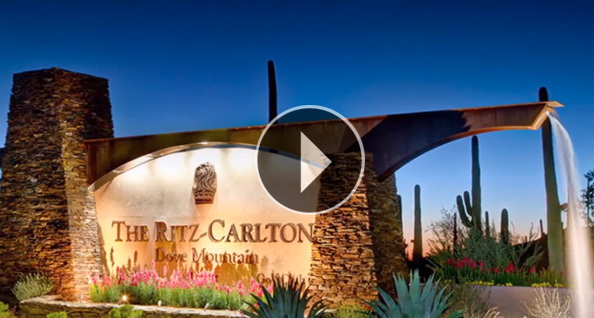 Already underway, the initial residential phase of The Residences at The Ritz-Carlton, Dove Mountain will have 110 highly-personalized homes featuring the finest in design and finishes, together with 16 custom estate homesites. New prices for the Amolillo single family homes start at $1.1 million; Seven Saguaros single family homes start at $1.5 million; and custom fairway homesites start at $590,000; villas start at $925,000; and Rockpoint Ridge custom homesites start at $605,000. Visit The Residences for more information and incentives. Property owners and Golf Club members will enjoy the wide array of amenities and impeccable service all managed by The Ritz-Carlton. The community features miles of world-class hiking trails, unparalleled access to The Ritz-Carlton’s new 250-room resort and spa, and dedicated “members-only” access to the 27-hole Jack Nicklaus Signature Golf Course and the facilities of The Ritz-Carlton Golf Club. In 2011, and for the third year in a row, The Residences will play host to the PGA Tour’s Accenture Match Play Championship, featuring the 64 best golfers in the world. One of Golfweek magazine’s “Best Courses you Can Play 2010,” the property’s Jack Nicklaus Signature Golf Course is among the 848 courses now listed by Audubon International and is a Certified Audubon Cooperative Sanctuary, one of only 15 courses in Arizona to receive the honor.